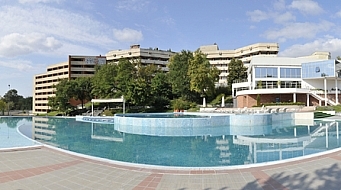 Hisar is a specialized centre for treatment, prophylaxis and metaphylaxis of nephro-urological, gastroenterological, gall bladder and liver diseases, metabolic disorders, as well as for rehabilitation of locomotor and peripheral nervous system diseases.The guests of the complex Hissar are offered both indoor and outdoor pools. Visitors can also enjoy the Wellness center of the hotel that comprises a wide range of facilities: (steam bath, hamam, ice room, Kneipp walk, infrared sauna, hot mineral water pool, adventure showers, shock showers, relax zone, roman bath), Relax center (sauna, steam bath, hot mineral water pool, indoor swimming pool, fitness), two table tennis and billiards halls, bowling hall with 6 lanes, two tennis courts and a night bar. In addition free parking is available.The Spa center is equipped with the latest state-of-art equipment. The center offers: sauna, solarium, different kinds of pearl tubs and hydromassage (tangentor), various massages, face and body therapies, cosmetic procedures, wellness and ayurveda therapies, fitness, numerous rehabilitation activities as well as physiotherapeutic procedures.